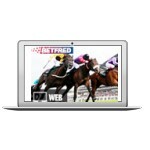 Betfred customers can now keep up to date with their races anytime, anywhere with live streaming on web and mobile devices now available. To qualify, customers must bet at least £1 on their chosen race. You can watch UK and Irish Racing and bet at the same time. We love this type of feature! What’s more, with Betfred’s Money back offer players will get their money back as a free bet should their selection finish second in the featured race. Not already a Betfred customer?